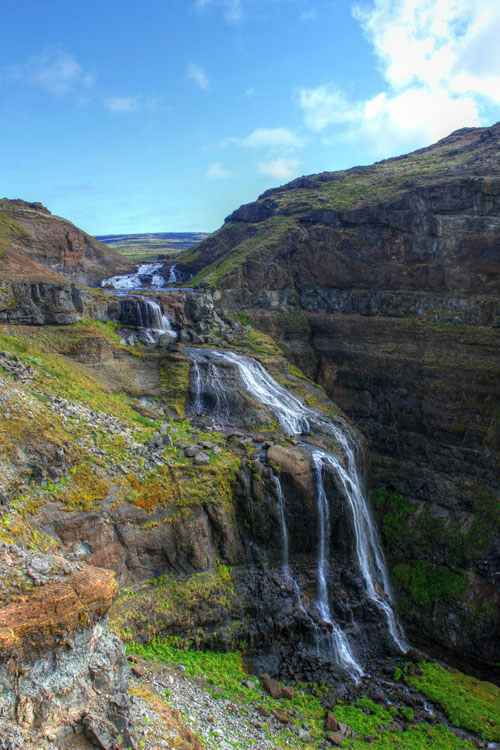 Cascading 196 meters down the deep gorge of the Botnsdalur valley is Iceland’s highest waterfall, Glymur. 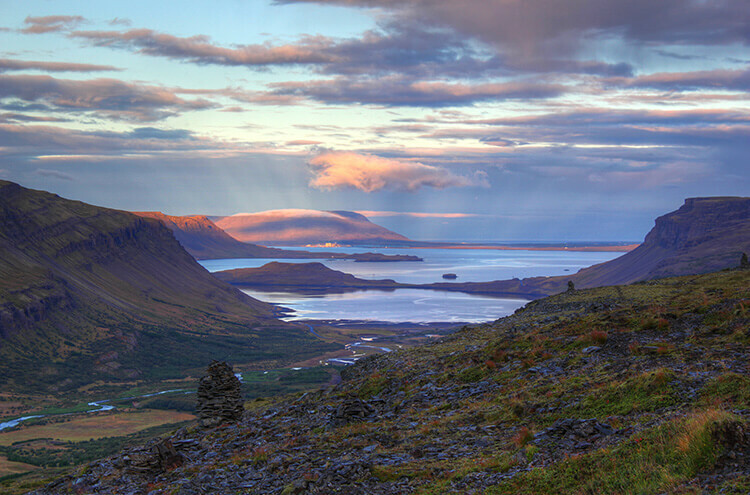 The river Botnsá leaves the lake Hvalvatn and after a short distance the water falls down alongside the volcano Hvalfell into a canyon with green moss. Unlike many other waterfalls in Iceland, it is not possible to drive to Glymur. So to see the beautiful waterfall, lace up your hiking boots. 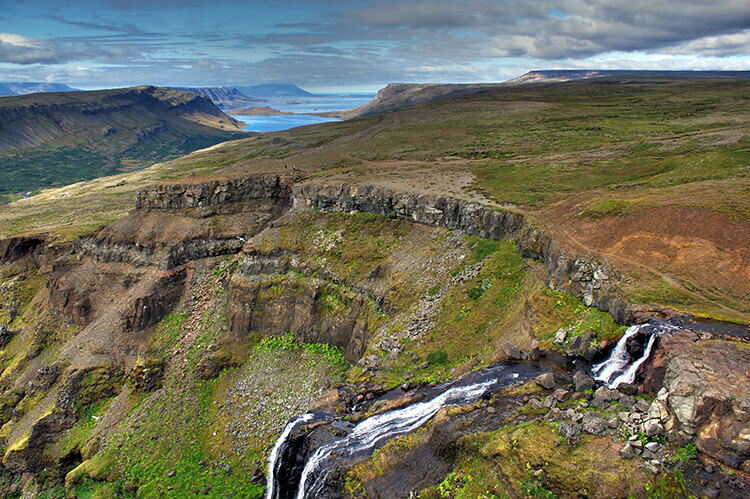 The view from the base of the waterfall is beautiful but hiking up to Glymur’s ledge provides a breathtaking view down the valley and out the Hvalfjörður fjord.The hike to the waterfall is not one for the faint of heart. The way down on the east side of the canyon is rather steep and you are mostly hiking along the edges of steep drop offs. 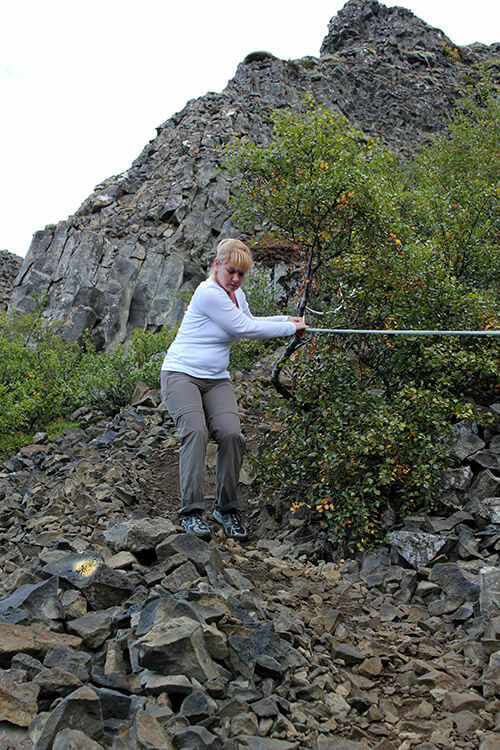 Halfway down the trail, ropes are available to hold on to as you make your way down over the loose talus. There are many vantage points to stop and admire Glymur from along the way down. Once back at the bottom of the canyon, you will need to cross the Botnsá river again over a log foot bridge reinforced and held in place by a steel cable. 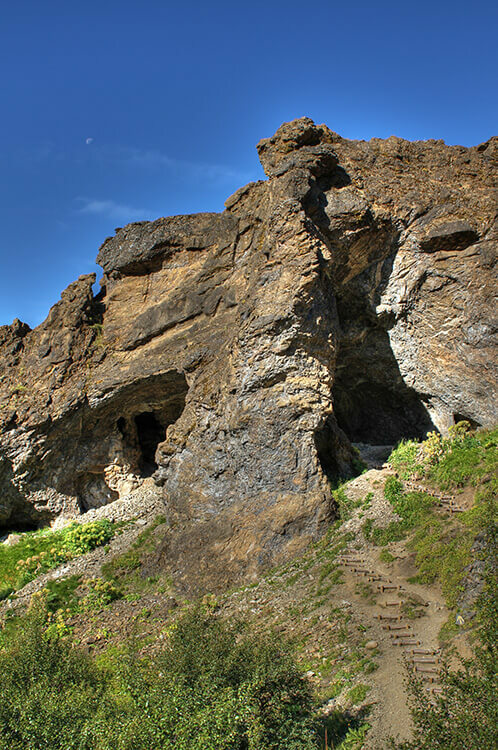 From there, descend back up out of the canyon through what appears to be a cave but is actually a natural stone arch. Great photos in this post. Looks like you may have got a cold soaker crossing the one stream. Thanks, Leigh! Yes, I tried stone hopping but the river was too wide. I finally just gave in and waded across the icy, glacial water. But soggy shoes on the way down was worth it for those views! The photos on top are brilliant. You guys have an absolutely fabulous blog going here – this really is inspiring stuff! Geez that looks like quite the intense hike to get out to the waterfall. Definitely seems worth it though. Exhausting but definitely worth the effort to see such a beautiful waterfall! It sure is, Sam. That, coupled with the variety of activities to do there, is why it’s our favorite country. Landscape of Iceland looks similar to South Island portion of New Zealand and so far NZ has been the best place we’ve so far visited! Wowww… such stunning pics … Iceland has been on our wish list for so long ..
How long did the hike take and how many miles do you think it is? The hike isn’t a very long hike; it’s 7.5 kilometers round trip. It’s just a very steep hike, so how long it takes you would depend on your fitness level. We hiked it in about 4 hours with stopping to take a lot of photos.